I was drawn by the book's cover for this purchase. I love how the fog is painted, obscuring the two fishermen on the small boat fishing on a misty day. Lou Bonamarte has taught watercolour for over forty years. In this book are his collection of tips and insight on watercolour paintings. The style you'll see in the book is that of traditional realism. There are lots of beautiful examples painted by the author. This isn't a hands-on tutorial book so to get the most out of it, you should already know how to paint watercolour, at least at the beginner's level. This book is about understanding why paintings are painted in a certain way. Using the cover painting for example, the author would explain that the boat's prow is left as a hard edge against the fog for contrast, and for depth, removing the fog from the foreground to reveal the shoreline and also showing the edge of the distant shore. What's not explained is the exact technique used, which in this case I would say is wet on wet, or how the colours are mixed to get the gradated look. The topics included cover light, value, colour and composition. There is more analysis than usual techniques-only books. In some ways, it reminded me of James Gurney's Color and Light: A Guide for the Realist Painter except the examples here are all watercolour. The book does a good job at explaining the concepts. There are some short useful exercises included, which involve copying line drawings and practicing what was taught. 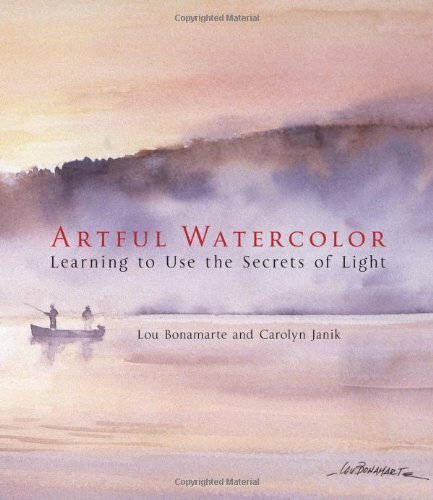 Recommended for watercolour beginners, and maybe intermediate painters. This is a nice reference book to accompany other techniques-only book.